My grandparents Chuck and Jean Lowry loved to go to on vacation, and often travelled with their friends Bob and Marion McDermott. 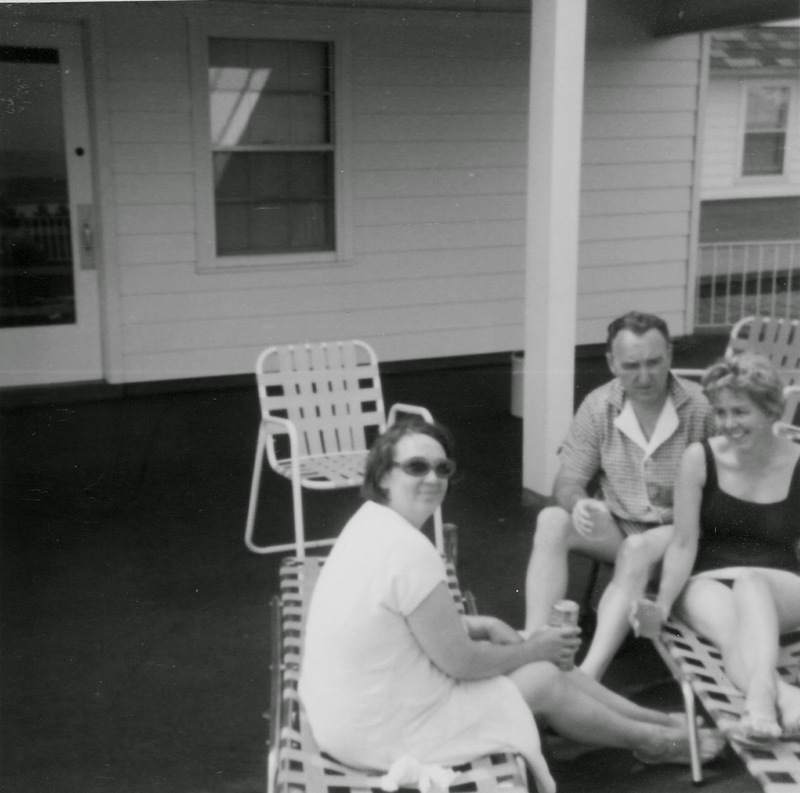 This particular vacation to sunny Miami looks just splendid, with gram in her shades drinking a beer and the McDermotts enjoying a refreshing Scotch and soda. My grandfather is the man behind the camera, blowing through 35mm film like a leaf in the wind. Gram looks up, wondering where he is going as he gets up from his chair. Bob is having a serious moment, still complaining about the waiter at dinner last night who didn’t bring the meals on time. Marion is sharing a laugh with my gram, maybe about the waiter or maybe about Bob still being frustrated with the waiter. *Click. * Photo taken. Or at least that’s how I imagine this scene occured. I know these four had a great time whereever they went, so I have no problem inventing fun for them. They would have done it anyway. Jean Groucutt Lowry (1924-1987), Robert McDermott, Marion McDermott, photograph, taken in Miami, Florida around 1966; digital image, photocopy of original, scanned in 2013 by Joseph Lowry; privately held by Mary McCaffrey, [address for private use], Canton, Ohio. Three individuals sitting on lounge chairs presumably near a pool. Provenance is Charles Lowry to Mary McCaffrey.